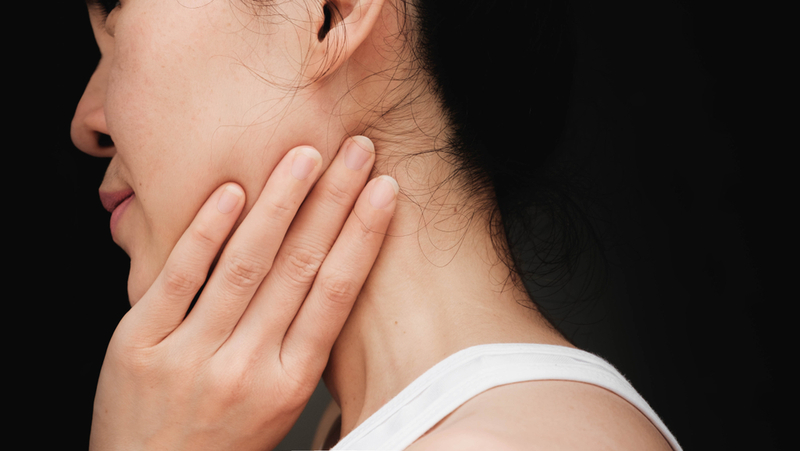 A sore jaw is more than just unpleasant. It can affect the way you eat, speak, and even how well you sleep. Because your jaw is linked to other structures of the face – like your ears and sinuses – it can even affect (or be affected by) these areas. It’s because of this interconnection that many patients who see our dentist in Berwick are unsure of the root of the problem. In today’s blog, we’re aiming to help you understand why you might be experiencing a sore jaw, and how to relieve it. Your jaw holds your teeth and gums. The upper part of your jaw is called the maxilla, and it doesn’t move. The lower part is the mandible. This is the movable part of the jaw that you use when you talk, yawn and chew. Your mandible is connected to your skull by a pair of joints called the temporomandibular joints (TMJs). These are what facilitate jaw movement. TMDs. Disorders of the temporomandibular joints are known as TMDs, or TMJ disorder. Symptoms include a locked jaw, tenderness in the jaw, headaches or a clicking sound when you use your jaw to chew or talk. TMDs predominantly arise from deeper problems with the muscles or jaw itself. Teeth grinding. Jaw pain and teeth grinding (bruxism) are closely linked. Often, bruxism is either a cause of, or a side effect of, jaw pain. Clenching and grinding your teeth together puts a strain on your jaw structure, which might be the cause of shooting pain in your jaw. Alternatively, the stress from jaw pain may cause you to grind your teeth as a side effect, which makes the pain worse. An uneven bite. When your top row and bottom row of teeth do not align, this is classified as an uneven or ‘bad’ bite. Whether you have an overbite or underbite, your jaw will be affected in the same way: it will not be able to function as it should. This causes ‘wear and tear’ on the jaw, which can then lead to jaw pain. The only way to cure a bad bite is to visit our dentist in Berwick for braces and orthodontics. Apply ice packs or warm packs. Applying an ice pack can help to neutralise the pain by numbing it for ten-minute intervals. Alternatively, a warm, wet cloth or warm pack can help to relax the muscles and joints connected to your jaw. Remember that you must cover heat or ice packs with a cloth at all times, as failing to do so can burn your skin. Use over-the-counter pain relievers. Some pain relievers might be able to reduce your discomfort by targeting the affected area. Speak to your GP or pharmacist to assess which medication will be most effective for you. Massage the painful area. Pressing the sore area gently and rubbing in circular motions can help to temporarily relieve tension in your jaw. It might also help to massage areas that are connected to the painful area, such as your neck. Experiencing jaw pain may be a red flag for deep-seeded jaw issues. After you soothe your jaw pain using the tips we have provided, it is extremely important that you book an appointment to see our dentist in Berwick. Getting a professional assessment of your situation is the only way to potentially cure the pain you are experiencing in your jaw. If you are experiencing a dental emergency, please do not hesitate to book an appointment with our dentist in Berwick, as we endeavour to assist all emergencies within 24 hours. Eden Rise Dental is a family-friendly dentist in Berwick that you can rely on for all dental concerns. Our experienced dentists can assist you with anything from general dentistry, to braces, to dental implants and root canal. Contact us to book an appointment with a friendly dentist in Berwick today.